This photograph was taken on Friday, February 20, 2004. It was my first time in New York City. I was there to visit my mother, who I had not seen for three years. 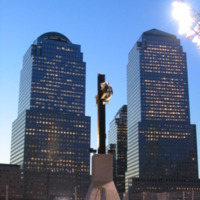 I have done extensive research into the World Trade Center, 09/11/2001, and what led up to the attacks. I could not have prepared myself for what I was about to see when we took the subway to lower Manhattan that day. I had to hold back my tears as to not embarrass myself in front of my mother. Knowing that almost 3,000 innocent people died there, and that two enormous buildings that once stood in the gaping hole in front of me were amongst some of the tallest buildings in the world suddenly hit me. All I could do is take as many pictures as I could to document the historical and sacred sight that I bear witness too. I went into the newly opened P.A.T.H. station and looked through the exposed area of the fence into the sight. The one thing that was so amazing was that these New Yorkers, who were coming and going in the station and witnessed the destruction of these buildings only two and a half years ago were able to leave their houses, and carry about their daily mundane activities. This trip has had a profound effect on me as a person. I know now that everything that you hold dear, everything that you love, can be gone in a matter of moments. Everything that I thought was so important, doesn't seem as important. Thank you. “2483.pjpeg,” September 11 Digital Archive, accessed April 18, 2019, http://911digitalarchive.org/items/show/33781.